Which souvenirs to bring from Russia? Shopping guide in Saint-Petersburg. What and where to buy? 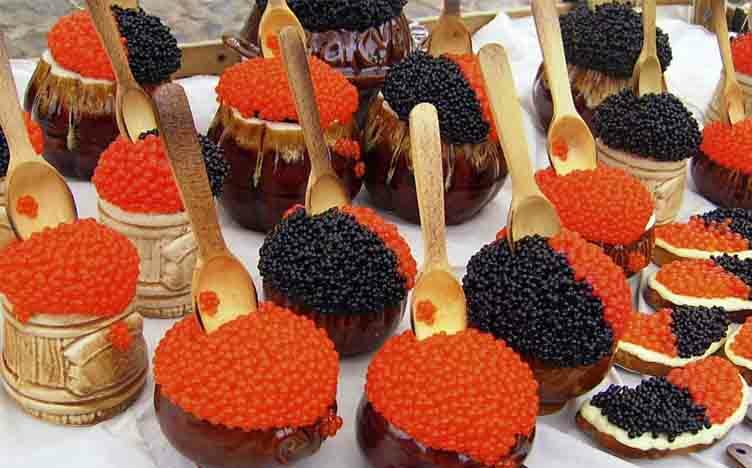 What do you know about traditional souvenirs from Russia? Most probably you've heard of Russian nesting doll (it's called 'mastryoshka' in Russian), but not many visitors to our country can remember other traditional crafts. During your tour you'll be able to see beautiful Palekh, bright shawls from Pavlovsky Posad, elegant amber jewelry, funny felt boots and numerous other souvenirs. This section represents the history of the main Russian crafts. 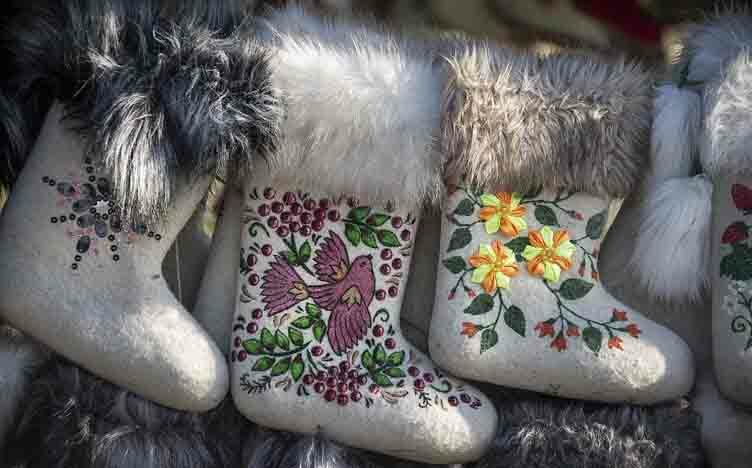 You'll have an idea of what to look for during your trip to the country and learn the story of the Russian folk art. Your guide will help you to find the perfect gift from Russia. If you're not into shopping souvenirs it might be a good idea to buy something traditional you can eat or drink, and we'll give you some tips on what food or drink could be a good present to your friends. Matryoshka is the best known and most popular Russian souvenir. It is a set of painted wooden dolls of decreasing sizes one hidden inside another. The number of nested figures usually varies from three to ten, but in some rare cases can reach 50 and even more. 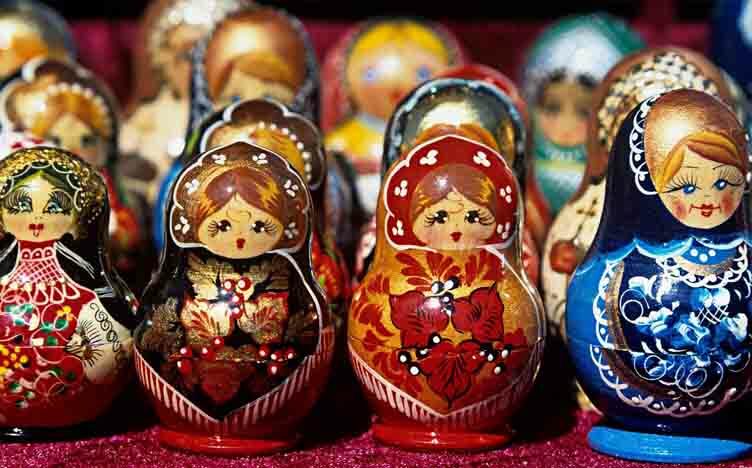 Traditional matryoshka doll represents a woman dressed in a Russian peasant dress wearing a scarf on her head. The name of the doll is a diminutive form of the name "Matryona". In pre-revolutionary Russia it was a female name, most popular in peasant families. It was derived from the Latin root 'mater' which means 'mother'. This name is associated with the mother of a large family who was a plump healthy woman. In the west the doll is often referred to as a 'Russian doll' or even 'babushka doll' which is wrong because 'babushka' means grandmother in Russian. It's hard to imagine that matryoshka didn't exist until the late 19th century. The first Russian nested doll set was carved in 1890 in Abramtsevo estate which belonged to Savva Mamontov who was a famous patron of arts. Many artists lived in worked in the estate. The doll represented a girl wearing a traditional dress holding a rooster. The smaller dolls inside were boys and girls and the smallest was a baby. The first matryoshka was carved by Vasily Zvyozdochkin from a design by Sergey Malyutin who painted the doll. There's a legend that the Russian artist was inspired by an old Japanese doll fukuruma which was also a nesting doll portraying a bald Buddhist monk. Even if you are in Russia for the first time during your Saint-Peterburg tour you probably heard something about Russian vodka. 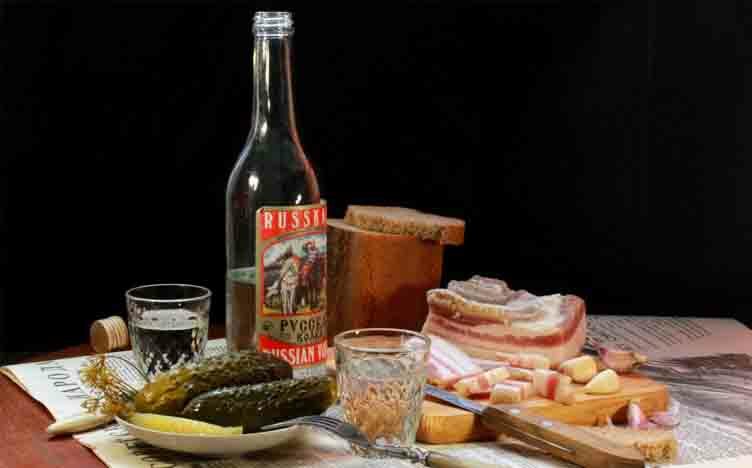 How comes this strong alcohol drink became an integral part of the Russian life? Let's get acquainted with the history of vodka with the help of your saint-petersburg tour guide and learn some interesting facts about Russian vodka. Ushanka or shapka ushanka is a traditional Russian fur hat. It has ear flaps that might be tied at the chin to protect ears and neck from the cold or fixed at the back of the head. It is known in the west sometimes as simply ‘shapka” (which actually means “hat’ in Russian) and its name ‘ushanka’ derives from the Russian word ushi (“ears”). The hat is usually made of sheepskin, rabbit or muskrat fur. It might also be made of artificial fur. In fact hats with ear protection were known in Russia and some other countries for centuries. But modern type of ushanka was developed in Russia in the 20th century. A hat very similar to modern ushanka appeared in 1918-1919 during the Civil War in Russia. It was introduced by Admiral Alexander Kolchak who ruled in Siberia and was the White Army commander as the army uniform. 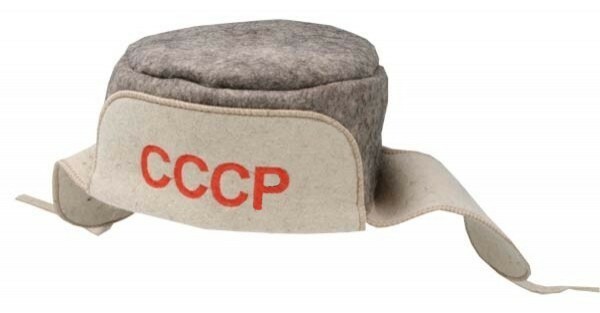 White Army lost the war but the hat was later widely used in the Soviet Union. Since 1940 the cap with earflaps became the uniform in the army and police. Shapka ushankas were also popular among Soviet leaders. Thus in 1960s-1970s Leonid Brezhnev started to wear reindeer-fawn hat and soon all members of the Soviet Government appeared in the same hats. Later Brezhnev also introduced the fashion of mink fur caps. Valenki or Russian felt boots used to be very popular footwear in winter. They’re not so widespread today in big cities but are still common in the countryside. Valenki are among the warmest footwear that can be used in severe winters, today valenki are usually worn by little kids. The name of the boots literally means "made by felting". They do not resist water; if the weather is slushy they are usually worn with rubber over boots. The tradition of making valenki was borrowed from Mongol tribes, but until 19th century they were quite expensive and only wealthy people could afford to wear them. Even tsars and tsarinas liked to wear valenki in winter, it's know that empresses Catherine II and Anna Ivanovna had valenki to match their luxurious ball gown. Amber is fossilized resin of ancient extinct coniferous trees known for its natural beauty and magic qualities. Amber was described by ancient Greek and Roman philosophers. In ancient times amber was often prized higher than jewels. Amber can range in color from dark brown to a light almost clear lemon yellow. 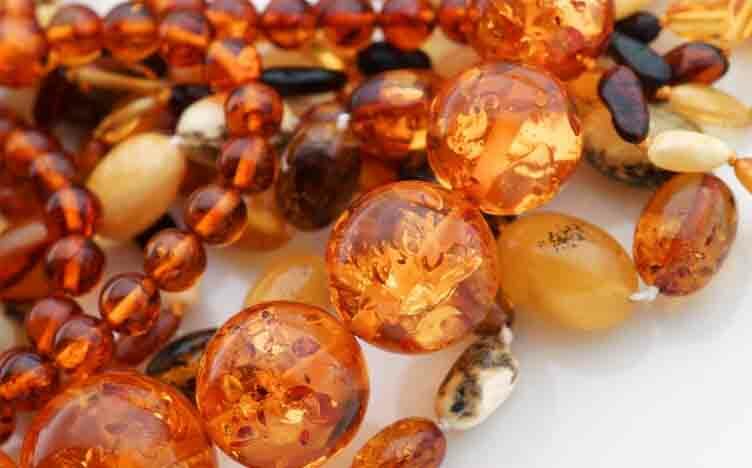 Most amber used in jewelry is from the region of the Baltic Sea. In old times people believed in magic and healing properties of amber. Thus Avicenna wrote in the early 11th century that amber cures many diseases, including stomach pains, abdominal cramps, fever, and fainting. Since ancient times amber has been used to make jewelry and household items. In the 18th-19th century it was a popular decoration for such practical items as cigarette cases, ashtrays, boxes, chests, clocks. In St Petersburg you'll have a chance to visit the famous Amber room faced with amber panels. Balalaika is a stringed instrument like a guitar but it has a three-cornered form and only three strings (in some cases two). Nowadays, it has almost completely disappeared from daily life. Only musicians in Russian folk music companies and in folk instrument orchestras play the balalaika. Its first mention was in an old document in 1688. 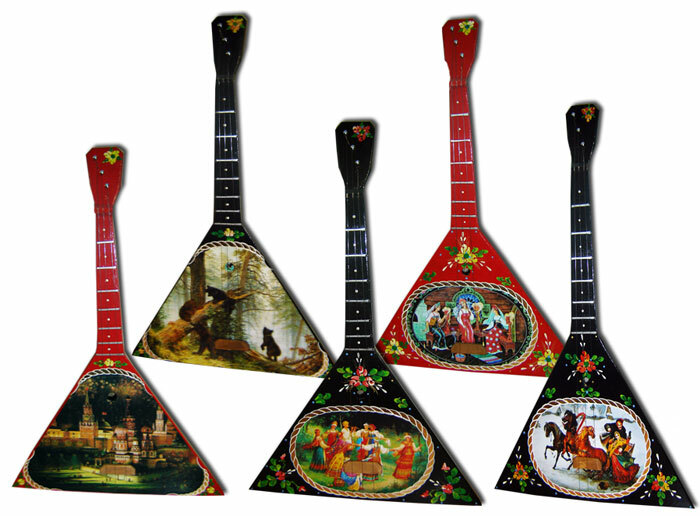 Balalaika is considered to be a symbol of Russian culture and Russian people similar to the accordion. Russian word “samovar”, which through the years has become one of the symbols of our country, can be translated to English as “self-boiler”. This metal container, traditionally used for heating water during the tea ceremony, is often mentioned in our literature, songs and folklore. Traditional samovar consists of body, base and chimney, cover and steam vent, handles, faucet and key, crown and ring, chimney extention and cap, drip-bowl and teapot. It heats water with the help of charcoal, that is put in its firebox. Russian samovar may have different shape (urn, krater, barrel, cylinder or sphere), vary in design and volume (may heat from 1 to 400 litres of water). The first Russian samovars heated with coal, according to the written documents, were made in Tula in the Lisitsyn brothers' workshop in 1778. By the XIX century Tula deserved a reputation of the main samovars' forgery. Even nowadays in Russian language there is a saying "to travel to Tula with one's own samovar", which in fact has the same meaning as “to carry coal to Newcastle” in English. 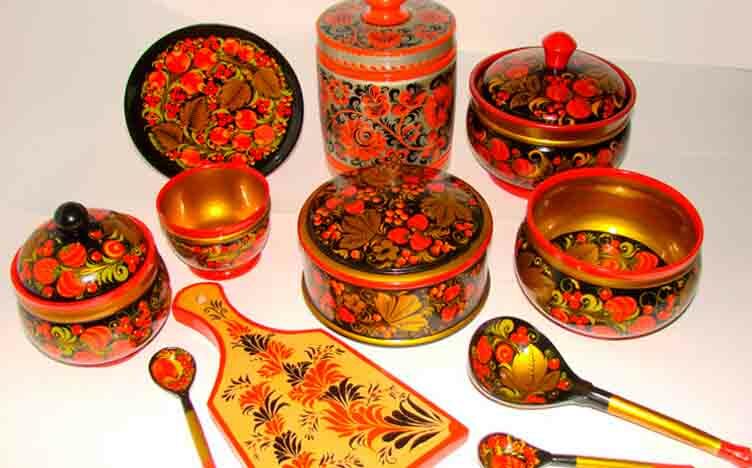 Khokhloma is a traditional Russian craft originated in the 17th century in the area of Nizhniy Novgorod. It's the style of painting on wooden tableware and furniture. Khokhloma style can be recognized for its red and gold flower pattern on a dark background. Most popular theme of paintings are flowers, strawberries, branches of mountain ash, sometimes birds, fish and animals. The beautiful pieces of tableware give you an impression of being painted with gold, but Kokhloma masters had an interesting secret of 'gilding'.Dishes were rubbed with tin powder, coated with linseed oil and heated in an oven. As a result of heat the linseed oil turned yellow, and the tin started to shine like gold. Most probably Khokhloma craft was invented by icon masters, as the technique of painting is quite similar. Some historians believe that this handicraft was started by Old Believers, a group of people who didn't accept church reforms of the 17th century and were severely persecuted by the officials. Many of them fled from big cities and took refuge in the woods of Nizhny Novgorod. Many of old believers new the secrets of icon painting who taught local craftsmen this painting technology. The Khokhloma handcraft was fading away in the early 20th century, but it revived during the Soviet times. The main centers of production are Khokhloma Painter factory near the Khokhloma village and Khokhloma Painting enterprise in a town of Semyonov. 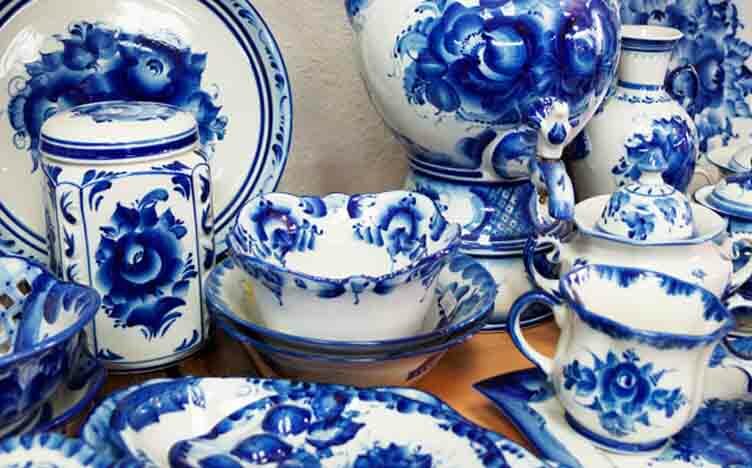 Gzhel is a style of Russian ceramics which originates from the village of Gzhel not far from Moscow. This area has long been famous for its clays. Since the XIV century the Gzhel and some 30 villages in the neighbohood have become the centre of Russian ceramic production. In the distant past Gzhel drawings were colored. Local masters painted clay household items: plates, dinner sets, mugs, jugs, toys, etc. Today the pottery feature distinctive blue designs on white background. This style of paintings was borrowed from the Dutch. White-and-blue paintings appear in an unusual way: At first the object is painted with cobalt oxide which is black. Then it covered with white glaze and placed in the oven. After heating the glaze becomes transparent and cobalt acquires sky-blue color. Gzhel ceramics is always hand-made! Artist paint every plate or vase with a brush, making each object an individual piece of art. 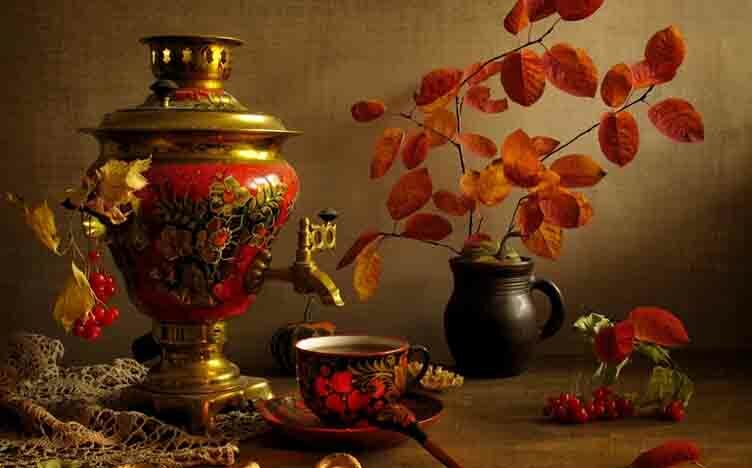 Many Russian people today collect Gzhel, decorating their houses with cups and plates, pitchers and samovars, clocks, teapots and funny figurines. One of the most popular Russian crafts which can be found in any open-air souvenir marker, at the stall or in a shop is Pavlov-Posad shawl. It is a perfect gift from Russia which will be an essential item in the wardrobe of any woman. The history of Pavlovo-Posad shawls goes back to late 18th century, when the factory was founded by Ivan Labsin. His business soon became very successful and known in different parts of Russian. Woven of yarns at the beginning printed woolen shawls replaced costly color woven shawls. Originally the hard wooden block used for each color was applied to print the design. In late 19th century it was replaced with metal plate and later with roller printing. The characteristic feature of such a shawl is bright whimsical floral ornament on the woolen shawl with tassels on its edges. The shawls ranging in colors and ornamental styles can satisfy the taste of the most demanding fashionable lady. No wonder that in 20th century in 1938 Pavlovo Posad received the Grand Prix at Paris World Fair and some years later a new generation of designers confirmed its status and were awarded at the Brussels World Trade Fair in 1959. 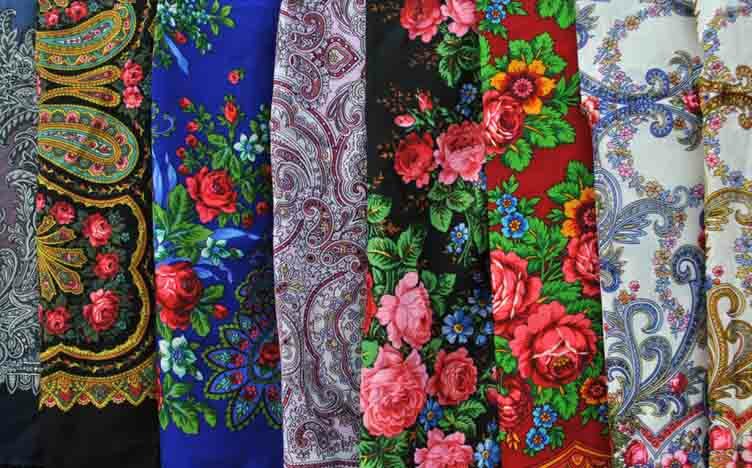 Thus Pavlovo-Posad shawls became world-known and loved not only in Russian but also beyond. Nowadays one can see Pavlovo-Posad shawl motives in the collections of haut-couture designers. What to see in St. Petersburg?